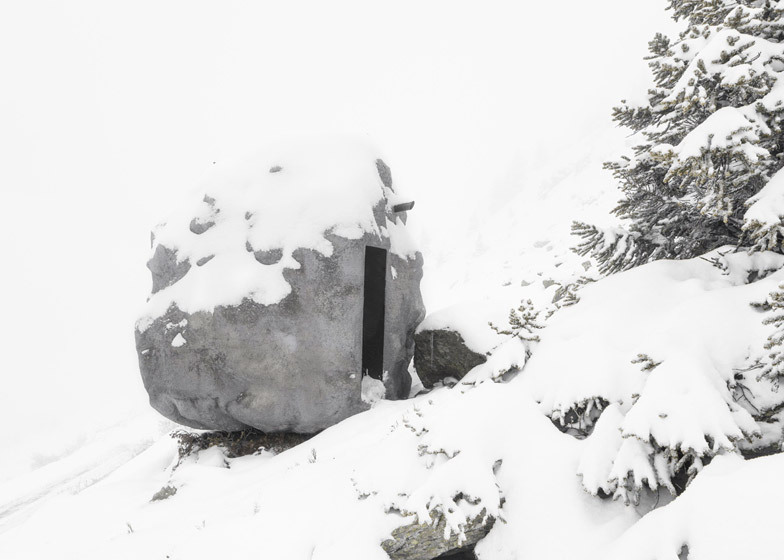 Swiss studio Bureau A has concealed a wooden cabin inside an artificial rock and transported it to a remote site in the Swiss Alps. Bureau A, a studio led by architects Leopold Banchini and Daniel Zamarbide, designed the mountain shelter to pay tribute to the central character in the novel Derborence by Swiss writer Charles-Ferdinand Ramuz. In the story, a shepherd named Antoine becomes trapped amongst rocks after a landslide, and survives there for seven weeks before finding his way home. The structure is named Antoine after him. "The mountains have the power to call for feelings of fascination and fear at the same time," said the architects. "Switzerland has a strong tradition of observing the Alps, living with them, hiding inside them." The shelter comprises a simple wooden cabin, encased within a concrete shell with the form of a huge rock. The interior is only revealed by a pair of small windows and a recessed doorway. Inside, the knotty timber has been left exposed on walls, floors and ceilings. Flaps fold down from the walls to create seating, a table and a bed, so that one person can stay comfortably inside. "Antoine creates an Alpine shelter, a precarious 'Existenzminimum' somewhat subversive in its use where one can freely enter and hide," said the architects, whose past projects include a pavilion made from recycled windows and a performance space on a tricycle. "It contains the very basic architectural elements – fireplace, bed, table, stool, window – but demands to the visitor some risk taking, as the rock hangs literally on the rock fall field," they added. The project was commissioned to host artist residencies for a programme run by the Verbier 3d Foundation. It was built by hand in a mountain village and transported to the site of the back of a lorry.